I really love doing outfit inspiration posts. I started with the Disney inspiration posts and now, after being inspired from this beautiful collection that my friend Kristy sent me, I've decided to do an art-inspired outfit. Because I wanted to do a breezy, floral-ly, airy one for the first, I chose the Hibiscus and Plumeria painting by Georgia O'Keeffe. Isn't there some rumor about Georgia O'Keeffe's paintings? Well, I picked one of her pieces that looked the least like...well...you get the idea. 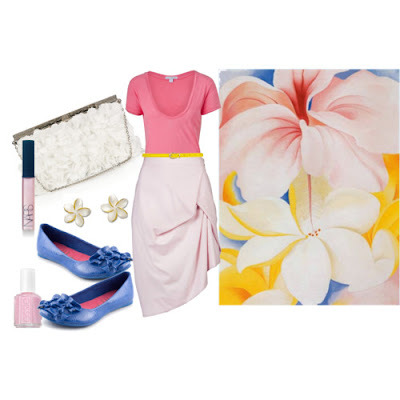 I love the pinks in this outfit--it's so summery and fun! P.S. I LOVE Mike's cranberry lemonade! DELISH! I love this idea even more than the Disney inspired ones, and they were wonderful!